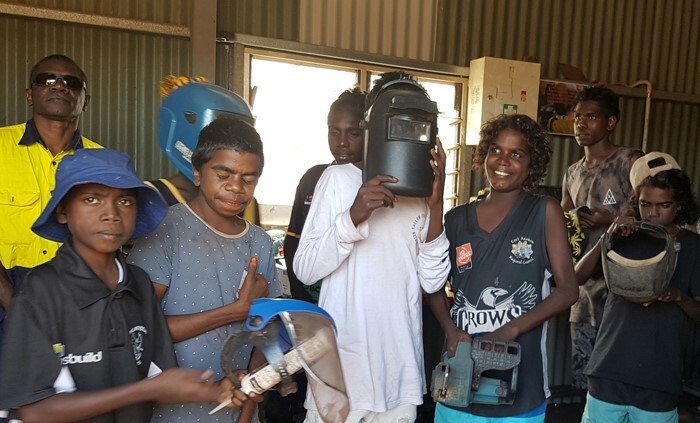 Community maintenance workers, “the Buffalo Boys”, are working with 25 Lake Evella School students to train them in occupational health and safety. The maintenance workers are introducing the students to risk assessment, personal protection equipment, and the importance and implementation of occupational health and safety protocols — all of which are part of a year-long employment pathways’ program. Lake Evella School principal, Clarice O’Leary, said the Buffalo Boys also showed the students a range of modern work practices as well as the traditional tools and methods used by their great grandfathers. “Employment pathways’ programs equip students with skills for a diverse range of careers by looking at common techniques, such as letter writing, occupational health and safety, personal protection equipment, completing forms and resume production,” she said.